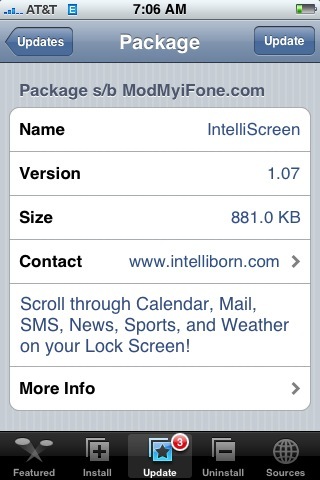 The update to version 1.07 of IntelliScreen does not make any visual changes to the application. It does however fix a few bugs. Below is the list of bug fixes. 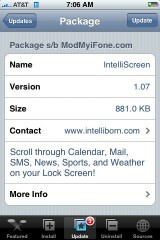 Doug says he feels that his iPhone unlocks slower after he update to version 1.06b of IntelliScreen. He was hoping that the update to version 1.07 would fix it however, he still feels it unlocks slow. Let us know in the comments if you are having the same problem or if yours is fine. Also, the pricing has not changed (see list below). IntelliScreen is available through he Intelliborn source. Same problem i unlocks slower then before!!! My version 1.06 was also very slow to unlock. I have not yet updated to 1.07 though. But I am looking forward to the bug fix about the SMS privacy with the home button. It not only unlocks slower but it indicates that the Calendar is in use when Today Only or Today/Tomrrow only is selceted for an option… All other calendar options work fine.. Anyone else having this problem? Slow unlocking here too…but I’m really forgiving since this is my #1 must-have application. I’d love to see titles only for the RSS feeds next. Mine is not only slow to unlock, but also occasionally freezes. This is an issue. I have to hard reboot each time. I love this app too, and will keep it on the phone, I hope for an update to fix these issues. In my case the update 1.07 makes everything works great! Unlock is slow, and battery drain too fast.